Operating Era: 1913-1965. Pennsylvania RR, Fruit Growers Express, National Car, Mathieson. PRR built over 3,400 R7 reefers between 1913 and 1915. They were built using the same framing as the X23 box car (see our series 10000). Earliest cars had arch bar trucks; Crown trucks were used in 1915. Otherwise, the only differences were in lettering, described fully in the history sheet. In 1915 100 cars were built for Adams Express service. In 1916-18 350 cars were converted to express service. Steam and signal lines were added (not supplied in the kit). In 1922 all freight R7s were leased to Fruit Growers Express. The express cars were grouped with other express service companies under the name American Railway Express in 1918. PRR issued revised specs in 1920 that used lap seam roofs and standard ice hatches. The express cars would have received these changes in the mid-1920s just as the X23s did. The express R7s were leased to Fruit Growers in 1929. Fruit Growers didn't rebuilt the roofs until about 1950 when Hutchins roofs replaced both the original standing seam roofs and the lap seam roofs. In 1942 approximatrely 250 cars were relettered for National Car Company. Most of the NX cars were gone by 1950. In 1950 15 cars were leased to Mathieson for dry ice service. These lasted until 1965. The Fruit Growers cars were gone by 1959. All kits in this series have ONE PIECE BODIES. 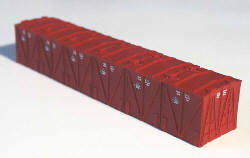 PLEASE SEE OUR SS BOX CAR SECTION FOR OTHER X23 KITS IN THE #10000 SERIES.